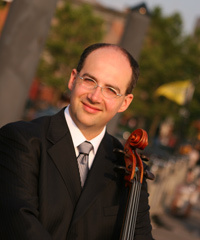 Universally admired by critics, audiences and fellow musicians, cellist Mark Kosower has earned an extraordinary international reputation for his instrumental mastery, musical integrity and powerfully expressive performances as soloist with orchestras, in recitals, chamber music and as Principal Cello of the Cleveland Orchestra with which he appears annually as soloist. He most recently performed the Samuel Barber Concerto at the Blossom Music Festival with Bramwell Tovey conducting and the Dvorak Concerto with Herbert Blomstedt conducting during the 2013-14 subscription season. During the 2014-15 season Mark Kosower will record the cello concertos of Victor Herbert with JoAnn Falletta and the Ulster Orchestra in Belfast for Naxos International. Other international appearances include the Dvorak Concerto with the Thailand Philharmonic and the Tchaikovsky Rococo Variations with the Camerata Franconia in Germany. In the United States Mark Kosower returns to the Toledo Symphony to perform the Friedrich Gulda Concerto with Stefan Sanderling and appears with the Hawaii Symphony performing the Lalo Concerto with Carlos Miguel Prieto. He visits the North Shore Chamber Music and Steamboat Spring’s Strings Music festivals as well as the Chamber Music Society of Palm Beach (FL).During the past two seasons Mark Kosower has debuted as soloist with the Rotterdam Philharmonic, the Orquestra Sinfonica de Venezuela, the Orquestra Filarmônica de Minas Gerais in Brazil, and the Virginia Symphony. He has also made appearances at the Eastern Music and Santa Fe Chamber Music festivals as well as at the Pacific Music Festival in Japan. An active advocate of 20th and 21st century music, Mark Kosower has brought lesser-known contemporary masterworks to international attention in recent years. His 2011 Naxos release of the two cello concertos of Alberto Ginastera, with Lothar Zagrosek and the Bamberg Symphony Orchestra, has won widespread critical acclaim – and, with his 2008 disc of the complete Ginastera works for cello and piano, makes him the first cellist to record the complete catalogue of works for solo cello by the composer. In 2011 Naxos also released Kosower’s performance as the soloist in the world premiere recording of Miklós Rózsa’s Rhapsodie for Cello and Orchestra with the Budapest Concert Orchestra MAV. Other premieres have included the world premiere of Cristóbal Halffter’s Klagelied eines verwundeten Vogels for solo cello, as well as U.S. premieres of Yuri Falik’s Concerto della Passione and Marco Stroppa’s Ay, there’s the rub for solo cello. He has also recorded the Walton Concerto with James DePriest and the Oregon Symphony. An eloquent orchestral soloist, Mark Kosower has appeared with the symphony orchestras of Detroit, Florida, Grand Rapids, Houston, Indianapolis, Milwaukee, Minnesota, North Carolina, Oregon, Phoenix, Santa Barbara, Seattle, Syracuse, and Toledo; the Buffalo Philharmonic, the Ravinia Festival Orchestra, and the St. Paul Chamber Orchestra, among others. International appearances include the Hong Kong Philharmonic, the China National Symphony Orchestra, the National Symphony Orchestra of Taiwan, the Kansai Philharmonic, the Orchestre de Paris, the Kwa-Zulu Natal Philharmonic, and the Brazilian Symphony Orchestra. With these appearances he has collaborated with James DePriest, Christoph Eschenbach, Joanne Falletta, Erich Kunzel, Nicholas McGegan, Anton Nanut, Stefan Sanderling, Gunther Schuller, Gerard Schwarz, Joseph Silverstein, Hugh Wolff, and Lothar Zagrosek. As a recitalist, Mark Kosower has performed on the Great Performer’s Series at Lincoln Center, at the Kennedy Center for the Performing Arts, the Aspen Music Festival, the Philadelphia Chamber Music Society, and the National Gallery of Art in Washington, D.C. He has also given solo performances in some of the world’s most prestigious venues including the Théâtre du Châtelet in Paris, Frankfurt’s Alte Oper, Berlin’s Komische Oper, the Hong Kong Cultural Centre, the Theatro Municipal in Rio de Janeiro, and in New York’s Avery Fisher Hall. A former member of Chamber Music Two, a two-year residency at the Chamber Music Society of Lincoln Center, Kosower makes frequent appearances at chamber music societies and festivals throughout the United States and abroad and has performed with such esteemed musicians as Leon Fleisher, Janos Starker, Jorg Widmann, and the Juilliard String Quartet. Mark Kosower has received an Avery Fisher Career Grant, a SONY Grant, and has been a top prize winner in both the Rostropovich and Pablo Casals International Cello competitions – including a special prize in both competitions for best interpretation of the newly commissioned works by Marco Stroppa and Cristóbal Halffter. He has also been the Grand Prize winner of both the Irving Klein International String Competition and the WAMSO Competition of the Minnesota Orchestra. Mark Kosower is currently Principal Cello of the Cleveland Orchestra, Teacher of Cello at the Cleveland Institute of Music and is on the faculty at the Kent/Blossom Music Festival. His previous posts include Solo Cellist of the Bamberg Symphony Orchestra in Germany from 2006-10, and Professor of Cello and Chamber Music at the San Francisco Conservatory of Music from 2005-07. Mark Kosower began his cello studies with his father at the age of 1 ½, and later studied with Janos Starker at Indiana University and Joel Krosnick at the Juilliard School.